I have to admit, this was something I was really hoping they would do. While I greatly enjoy Surviving Mars, it can be a little dull in terms of looks so giving it a good bit of colour sounds great. 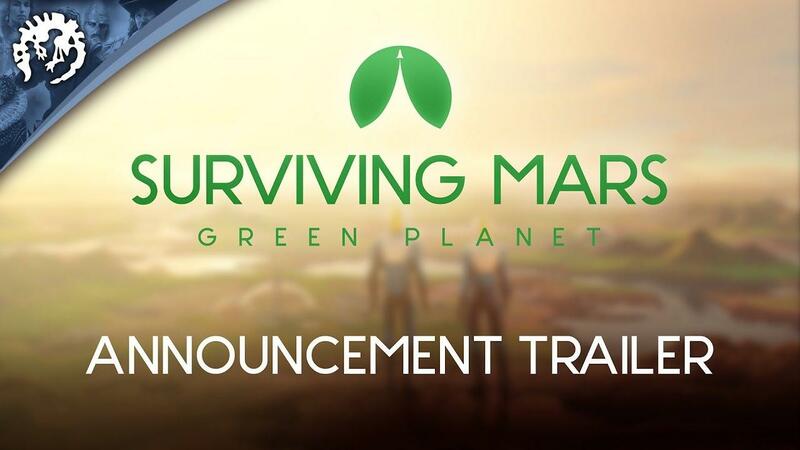 Terraforming - Terraform Mars and make the hostile planet habitable for humanity. Each decision you make while managing your colony can affect the Terraforming Parameters, which include the Atmosphere, Temperature, Water, and Vegetation, and ideally brings them closer to habitable levels. Monitor your progress on a planetary scale with the Planetary Overview UI. Green Mars - Seed the surface of Mars with various lichen, grass, shrubs, or trees and watch as they begin to turn the Red Planet green. Low maintenance plants like Lichen can improve the soil quality to help more complex plants grow while Trees produce high seed yields for your colony to harvest. Be sure to monitor your soil quality levels to keep your plants healthy and growing. Special Projects - Take on seven challenging Special Projects like melting the polar caps, capturing ice asteroids, launching a space mirror, and more to begin shifting the Terraforming Parameters. Be careful, these projects will have a lasting impact on the planet and can trigger natural disasters! 7 New Wonders of Mars - Construct seven new buildings that can help you terraform the planet or capitalize on the changes. Use the GHG factory to release greenhouse gasses into the atmosphere, the Forestation Plant to boost vegetation production, the Water Pump to fill lake bed, and more. Climate Calamities - Terraforming a planet can have unexpected consequences. If you release too many greenhouse gasses into the atmosphere you can trigger acid rain which reduces soil quality, or if an asteroid slams into the planet it will cause a Marsquake that can disrupt your colony’s production. You can follow it along on Steam and the Paradox Store. The expansion will also come to Humble Store and GOG as well of course but no store pages are up for it on there yet. Sounds awesome. I never really got all that far in SM when I first played it, and going back to it recently I realised there's a lot of stuff in there which I didn't expect that keeps your interest going once you've got a nice colony ticking along and it might otherwise start to wane (no spoilers for anyone who doesn't have it, but long-time players will probably know what I'm talking about). Absolutely brilliant game. Dunc Sounds awesome. I never really got all that far in SM when I first played it, and going back to it recently I realised there's a lot of stuff in there which I didn't expect that keeps your interest going once you've got a nice colony ticking along and it might otherwise start to wane (no spoilers for anyone who doesn't have it, but long-time players will probably know what I'm talking about). Absolutely brilliant game. Yup! It certainly does have a slow start, but it's wonderful when you start getting through some research and build up a big colony. That's the biggest problem I have with the game. No matter where you start, the first 10-15 hours of the game are basically identical. A lot of "survival management" games have that problem, but some (like Rise To Ruins) can give you a vastly different situation to start in. While Mars... is always Mars, only slightly varying in availability of resources and frequency of "bad things". But that increases only challenge, not variance. This is taking me back to Kim Stanley Robinson's "Red Mars", "Green Mars", "Blue Mars" trilogy. The whole idea of terraforming mars is a bit of a pipe dream. The amount of energy and resources needed makes it impractical and impossible for humans to achieve, but whatever.. Yes, but that's how it always starts..
Yeah, well, if you want to have fun thinking about terraforming it's pretty much the only game in town. It's not like anyone's gonna terraform Jupiter, or even Venus. I do wonder about fiddling with the orbit of something big and made of volatiles to smash it into Mars (which appears to be one of the game options). That would give you some water and atmosphere to start from. You could use its own substance for reaction mass so it wouldn't be so huge a project . . . Impractical, sure, but impractical things have been done before. Impossible? I wouldn't think so.